The cost. The hassle factor. The packing. Flying with a bicycle is no fun. Well, actually physically flying would be amazing. I mean boarding a plane with a bike. I wrote a column almost ten years ago about this topic for Adventure Cyclist (Flying the Friendly Skies (If you’re a golfer)) and never could get a straight answer from the airlines. And time has not been a cyclist’s friend. It’s worse now. The airlines are upping their fees for everything. But they seem to see bikes as the biggest cash cow. Delta … $400! Lufthansa … $500! OUCH!!! There are all sorts of options– from folding bikes to renting a bike at your destination to taking up hiking instead. We have Rodriguez travel bikes. Love them. They are equipped with S&S Couplings. These couplings make it possible to pack a standard bicycle into a 26X26X10 inch box. That’s 62 linear inches. That is a magic number. Sixty-two linear inches is what most airlines allow as checked baggage. Anything bigger is subject to charge. Most people traveling with bicycles this way, carry them in hard shell bicycle boxes. They do the job. But they are expensive and bulky. 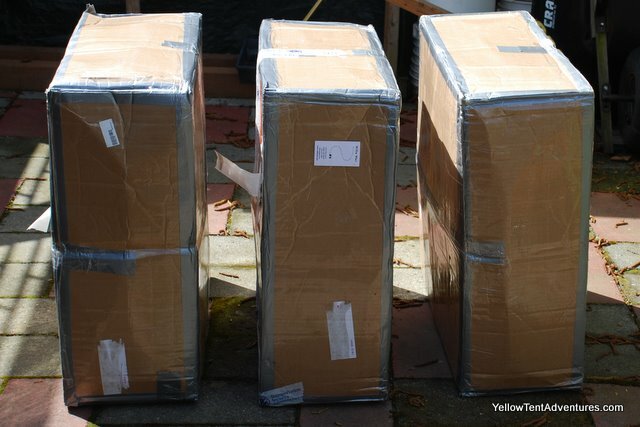 What do you do with those boxes when you get to your destination? If you are flying home from the same airport, you can try and find a kindly innkeeper who will store them. But they are BIG. What about a cardboard box? I managed to find a company that sells cardboard boxes in every size imaginable … including 26X26X10. I bought ten of them. We were about ready to travel to Colombia, so I did a test run. I had a speaking engagement in Indianapolis, so I packed up my bike and flew it to Indy and back. The box had it’s share of rips and dings … but that’s what duct tape is for! The life span appeared to be one round trip. Perfect. Three boxes. Two for bikes. One for stuff. 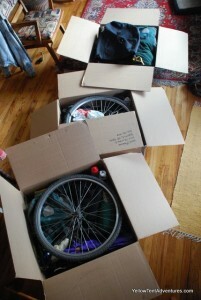 For our flight to Bogotá, we packed our bikes in two boxes and used a third to pack all our gear. (There are all sorts of pages on the web that go into the details of the actually packing process). I took the extra time to completely cover the outside surface of the cardboard boxes with packing tape. Moisture and cardboard=mush. We caught a cab from the airport to our hotel in Bogotá. After we unpacked at our hotel, the flattened boxes were a manageable size. The owner was delighted to store them for us for three months, awaiting our return. Cardboard? But don’t your bikes get scratched? Yes. They do. Sometimes even dinged. But they are made of steel, not carbon fiber. They are meant to travel. If you are going on a long distance international bike trip and are worried about your bike getting scratched … you’ve got the wrong bike … and maybe the wrong trip in mind. I embrace scratches on my bike the same way I embrace wrinkles on my face … they are signs that I’ve lived life! Our bikes have lived well. 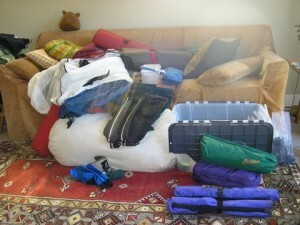 We will use the same packing method to get our bikes to Madrid. A note: Airlines are beginning to charge extra fees for bikes regardless of the size of box you pack them in. This means you have to get creative when declaring the contents of your box at the counter. Sports equipment. Display materials. Bicycle PARTS. I’ve heard many a cyclist’s declaration. My favorite was “inline wheelchair”. A great source for information about bikes on flights is IBIKE (International Bike Fund). They have a detailed post about airline baggage regulations and traveling with a bicycle. The above isn’t THE way to fly with a bike, just our way. Feel free to share yours. As Kat and I rush around trying to get ready for a bicycle trip in Spain and Portugal, I’m reminded of a column I wrote for Adventure Cyclist magazine as we were rushing around trying to get ready for a bicycle trip in Colombia. Time has passed, but not much has changed. The following is an excerpt from my book Travels with Willie: Adventure Cyclist. I vividly remember watching the launch of the Space Shuttle Discovery. The camera zoomed in as the rockets ignited. The billowing fireballs, its shear power and energy, were awesome. But the shuttle just sat there. Was something wrong? Then there was movement, almost undetectable movement, as the shuttle struggled. It was hard to believe that this lumbering, struggling vehicle would soon be up in space and free from the force of the earth’s gravity. I love travel—the open road, the undiscovered nooks and crannies off of the tourist track. There are moments on a bicycle journey when I believe I’ve discovered true bliss. Yet, in order for me to take that bike trip, I first must break free from the gravitational pull of home. Actually, Kat and I both struggle with it. The list of things to do before we go has increased with time—getting a house sitter (and one who likes cats), finishing up work projects, getting rid of enough stuff that the house sitter has enough room to live in our house, finishing house projects so a house sitter would actually like to live in our house, paying bills, paying other bills in advance, finding people willing to fill in with several nonprofit projects we work on, shoveling a layer of compost on the garden, filing for an extension for our taxes, going to the dentist. It wasn’t always this complicated, was it? Twenty years ago, I lived in a dumpy basement apartment. My bedroom had no windows. My roommates and I couldn’t afford to turn on the heat, so you could see your breath inside the apartment from November through February. I had no furniture to speak of, unless you count a cardboard apple box used as a bed-side table. I didn’t have a cat, but my roommate did. The cat had fleas. The fleas liked me … a lot. When I embarked on a bicycle journey, instead of pulling free of gravity like Discovery, leaving was more akin to being a hummingbird sitting on a branch and then instantly and effortlessly zooming into the sky. I didn’t leave … I escaped. Over ninety percent of the weight of the Space Shuttle at liftoff is fuel that will be burned in the first eight and a half minutes of flight. Almost all of its resources are used solely to break free from the pull of the earth’s gravity. Leaving the earth is hard—outer space is a breeze by comparison. It is the same for many a journey; leaving home is the hard part—the actual trip is easy in comparison. I’ve known people who have been planning trips for years (decades even), and still haven’t made the move. They keep asking the same questions and search for the perfect bike. They go on countless training rides and take a language course. They buy maps and tour guides, but never take the trip. Then there is the money issue. A few of them get it. But most get a car and a wallet full of credit cards. You would think that the best way to be a world traveler would be to have no home, no base, no ties of any kind. However, I believe home grounds us as travelers. I’ve met too many people who severed all ties with home, only to become aimless wanderers. Traveling without a purpose or goal can become just as mind numbing as the world’s worst desk job. I think he is right. Each trip shapes me as a person. So much of what I believe and who I am comes from the combined experiences of my journeys. Do I long to return to the days of basement apartment living with no heat? Not a chance. I love my city, my neighborhood, my garden and my cat. But I also love to get on my bicycle and go. That’s why we’re packing and storing and running a thousand errands in preparation for another trip. I can’t change gravity. The physical, financial and emotional pull of home is there and I am a fool to try and ignore it. It’s better to acknowledge it, celebrate it. I consider myself fortunate to love home as much as the open road. It takes a lot more time and energy than it did twenty years ago, but the ride is still worth it. I don’t escape anymore. I lift off. Lift Off was originally published in Adventure Cyclist magazine. Lauren and Leigh bicycle from their Beacon Hill neighborhood to join H-o-W downtown for dinner. I love to ride my bike whether it’s running the regular errands of life or putting in miles getting ready for a trip. For years every time I road my bicycle, short distance or long, I switched my shoes, put on my black Lycra shorts, and donned my day-glo jacket before taking off. Last year after I was sold bike shoes that looked and felt like aliens that ultimately I could not abide, I switched to regular ol’ platform pedals while I looked for bike shoes that I could wear. That was the beginning of the end. I stopped “clicking in” to ride the mile to the produce stand. 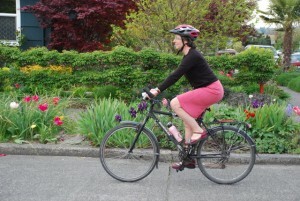 I started wearing a merino wool skirt and Mary-janes on rides across town to a regular meeting. I looked for fun clothes to ride and wear to dinner parties. The less I used special clothes to ride my bike, the more I felt the bike was just an extension of my life. The joy of riding my bike around town hit a new high as we entered our 5th year of living car-free. Mark your calendars for a girls night out with a twist! We’ll glide down Atlanta’s signature street, Peachtree, for a night on the town without the hassle of figuring out who will drive, where to park, and how to avoid the traffic. Wear your finest so we can demonstrate just how easy it can be (should be!) to ride a bike in Atlanta. 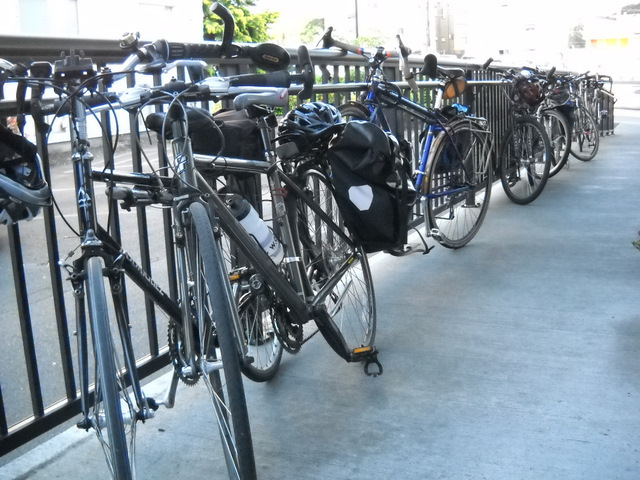 Our goal is to turn a few heads and shift people’s thinking about a) WHO rides bikes (it’s not just men) and b) WHERE people ride bikes (biking intown can be a safe and practical way of getting around). 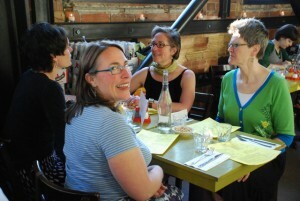 Juliette, Rebecca, Kat and Barbara enjoy dinner fresh off their bicycles. That little tidbit was the spark that lead me to call together 3 friends, invited them to meet me for “Lycra-free” dinner we arrive at by bicycle. We met for dinner at Cafe Presse – natural meeting place with a car-size bike rack outside the door – and we too called it a “Heels on Wheels” night out. 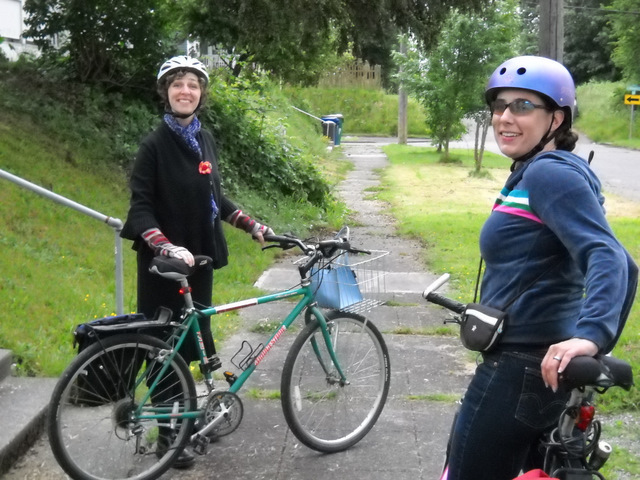 If gals from Atlanta could do it, certainly there is room in a bicycle-city like Seattle to expand the definition and expectations of riding a bike. Short on bike parking, street sign poles will have to do. Since then, the guest list has expanded to 40+ women friends who have shown an interest in shedding that “I am a cyclist” look and just ride a bike like you were going out for dinner. Each month women bike to different locations, daisy-chain our bikes together outside, and enjoy a dinner sharing food and swapping stories. 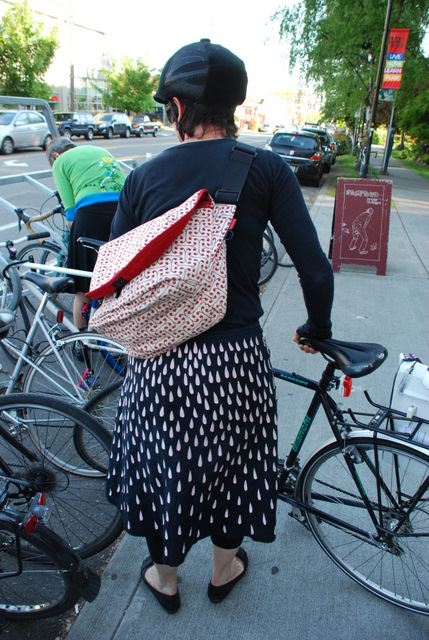 Women who have never pedaled beyond their neighborhood are making their way downtown or even across town, and women who have logged thousands of miles and worn out many pairs of Lycra shorts are showing up in dinner-party style. Over the summer of Heels on Wheels meet-ups, Wheelies, as we fondly call ourselves, have purchased new bicycles, new gear and new clothes. 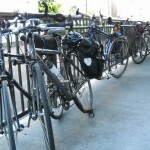 We’ve found restaurants that welcome a dozen bicycle parked outside. We discuss the dearth of stylish, let alone serviceable rain gear, as well as tips for how best to keep our skirts down in a breeze. 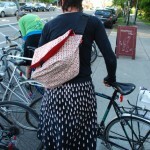 Juliette sports a great bag from Hub and Bespoke. 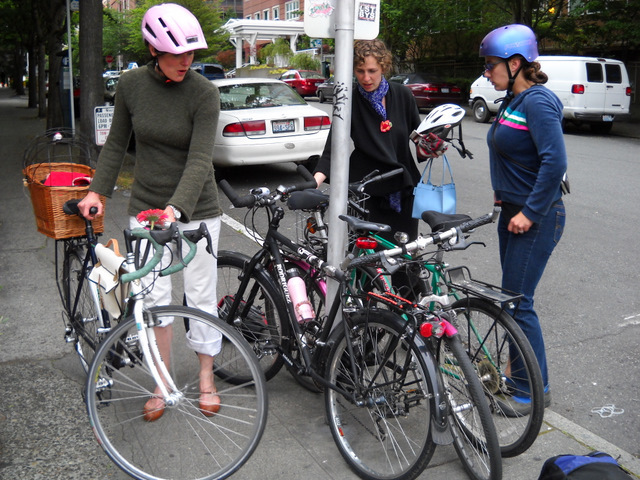 The bicycle industry should know that women talk about sales people not really listening or respecting how we like to use our bikes, nor do they often address and how poorly many bikes fit our bodes and our lives. We are looking for better ways to carry our bags, books and groceries. We want cool clothes that ride well and look “normal” when we step off the bike. Women who ride bikes are clearly untapped marketing potential. The entry ramp to Verve in Columbia City makes a great parking lane. Women who ride bikes are also untapped advocacy potential. I’ve introduced friends to bike paths and lanes and hopefully unleashed their desire for more safe amenities for cyclists. If you’ve been riding a bike and feel fine “taking your lane” in traffic, take a novice rider for a spin and you’ll see the world from the perspective of the masses of potential bike riders. The number of sport-cyclists who enjoy the workout of a hard ride, or even the commute cyclist who rides to work every day is a drop in the bucket compared to the potential ocean of women and men who could just ride their bike to get around town. Tap into that ocean and there is the potential to change the image of bicycles as a specialized vehicle for athletes into bikes – and bicycle resources – for everyone. Heels are not required, but bikeable skirts are favored in warm weather. Woman needing some encouragement should know too that skirts turn heads! 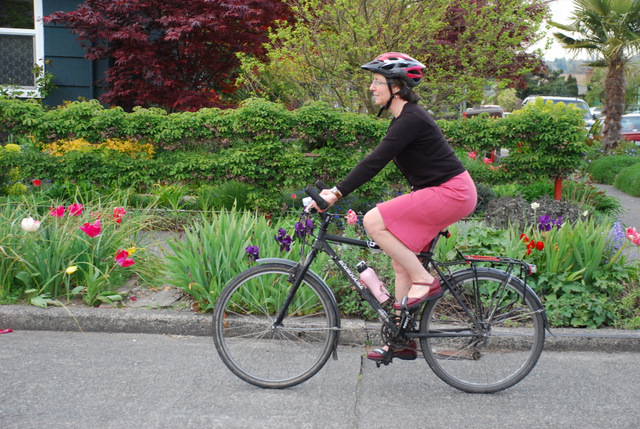 I’ve received more waves, acts of kindnesses, thumbs up, and positive encouragement riding around the streets of Seattle in my pink skirt than I ever felt in my black shorts. The world is a friendlier place when drivers take notice and give a little extra room. Kat leaves home for a night out with the Wheelies. 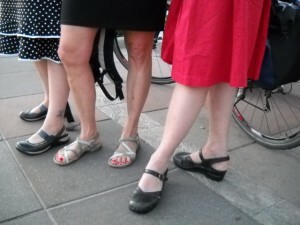 Start your own Heels on Wheels group and invite your friends to join you pedaling to a night out on the town.